Smart lille failsafe, som gør at servoen stilles i neutral såfremt forbindelsen imellem fjernbetjening og bil forsvinder/mistes. Særlig gavligt ved nitro-biler, hvor der sidder en servo til gas/throttle. Enheden er så lille at den passer ind stort set alle steder. Protect your car or truck from dangerous runaway conditions with this exclusive HPI Failsafe unit! Simply plug it in between your throttle servo and receiver for instant protection, just in case your receiver battery runs low or you lose radio signal while out on the track. Press the button on the failsafe to select the throttle position (neutral or partial brake is recommended) and you'll be able to drive in confidence, knowing your vehicle and spectators will be OK in the event of radio or electrical problems. This is the ideal add-on accessory for anyone using a nitro- or petrol-powered RC vehicle. 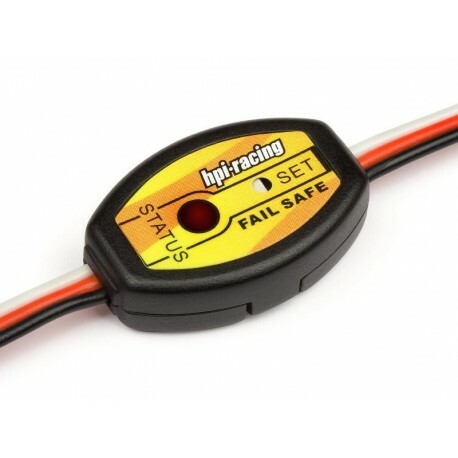 Save your car or truck, install the HPI Failsafe! Note: the RF-20 radio system as used in the RTR Baja vehicles already features a low-voltage failsafe system.